Feelle Solar Fountain Pump with Battery Backup, Solar Powered Bird Bath Fountain 1.5W Upgraded Solar Panel Kit Water Pump for Birdbath, Pond, Pool,Garden and Lawn | Fountain City Art Ctr. Feelle Solar Fountain Pump with Battery Backup, Solar Powered Bird Bath Fountain 1.5W Upgraded Solar Panel Kit Water Pump for Birdbath, Pond, Pool,Garden and Lawn by Feelle at Fountain City Art Ctr.. MPN: FLSC0086. Hurry! Limited time offer. Offer valid only while supplies last. Build-in Battery : The fountain pump has a built-in battery backup which can storage power when the panel get sunlight, making it continuously spray water when cloudy. Smart water-level monitoring system: the pump will stop working automatically when the water is runing out to protect the fountain, and the solar panel will charge the backup battery. Suction Cup: The fountain is floating, but if you don't want it floating or water splashing everywhere, you can use the suction cup to secure the pump in the container. 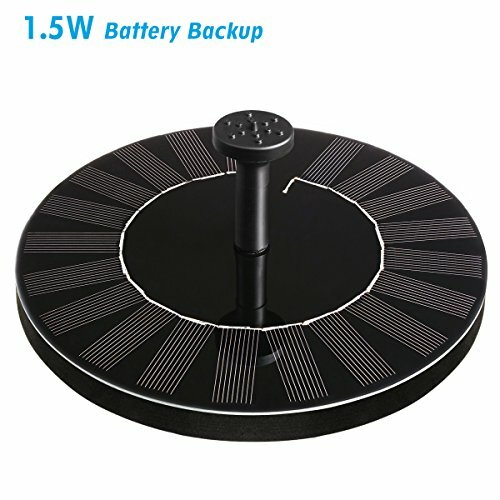 12 Months Warranty: 100% warranty and friendly customer service, you can contact us at anytime, if there is problem about our product and we will reply you within 24 hours. If you have any questions about this product by Feelle, contact us by completing and submitting the form below. If you are looking for a specif part number, please include it with your message. Alpine MAZ254 6 Hanging Cup Tier Layered Floor Fountain, 36"
LATITOP Upgraded 1.5W Solar Fountain Water Pump with Battery Backup, Free Standing, Submersible, for Bird Bath, Garden, Back Yard and Small Pond.